When children and their families enter the prekindergarten classroom, they see a room designed to engage children in intentional and active learning. Within the first 20 minutes of the day, children sign in, answer a yes-or-no poll question (“Do you like to swim?”), and then consult a chart to determine at which learning center they will start their morning. The teacher, Ms. Price, circulates to help children achieve specified learning goals. In the writing center she helps Angela print her name by referring to the alphabet chart to help her find the letter that makes the L sound. She asks José about his new shoes, which they will sing a song about later at circle time. She assists Steven by dictating words for a message he will share with his classmates during circle time. Ms. Price talks directly to the children (“Tell me about your new shoes”), offers reminders when needed (“We will start cleaning up in 10 minutes”), and comments on their work (“Angela, I see you wrote all of the letters in your name”). This scenario comes from an investigation into how three pre-K teachers—whom their peers, administrators, and teacher educators identified as effective early educators—used developmentally appropriate teaching practices (Copple & Bredekamp 2009) to help the children they taught successfully transition to a standardized kindergarten learning context. In the study, we found that these teachers, whose programs are located in elementary schools, faced a unique challenge. According to Ms. Price, who had taught at the same school for 22 years, administrators and elementary school colleagues were visiting her classroom more frequently than in previous years asking questions such as, “Why are you doing this?,” “What are the children learning?,” and “How does this prepare children for kindergarten?” This press for accountability led Ms. Price and the other teachers in the study to dedicate more time and attention to explaining to visitors how intentional integration of activities such as singing, movement, and play— and the use of visual (child-generated graphs), auditory (books on tape), and tactile materials (blocks)—accommodates the diverse learning styles of the children in the classroom and prepares them for the academic curriculum of kindergarten and the primary grades. Early educators recognize that the learning experiences the children in Ms. Price’s classroom engaged in align with what is known about how children develop and learn (Shonkoff & Phillips 2000). Yet in studying these teachers, we found that their principals and elementary school colleagues struggled to recognize how such practices prepare children for the academic rigor of elementary school. Elementary school teachers’ and administrators’ lack of understanding about Developmentally Appropriate Practice (DAP) is well documented (Copple & Bredekamp 2008), and requests for early educators to show clear connections between their teaching and children’s learning have intensified. Policy makers at all levels of government have made improving children’s academic achievement the focus of education reform (e.g., Brown 2013). These circumstances give teachers and administrators of public education programs an opportunity to share how their classroom teaching practices help children achieve this goal. In elementary and secondary schools it is becoming more common to consider academic rigor an indicator of the quality of instructional practice. We contend that Ms. Price’s morning routine practices are both rigorous and developmentally appropriate. She demonstrated rigor through her intentional and strategic plan for conversations with and between children and in integrating play and exploration into the curriculum. Doing so allowed children to work toward early literacy outcomes such as translating spoken language and sound units into written symbols and demonstrating their knowledge through a range of kinesthetic, verbal, auditory, and visual modalities. The morning routine practices are developmentally appropriate in that they offered the children the chance to activate as well as develop cognitive, social, and emotional skills that supported their development as learners (Copple & Bredekamp 2009). Stating that Ms. Price’s learning environment exemplifies rigorous DAP may sound incompatible with the language of early childhood. However, rigor and developmentally appropriate practice do not have to exist in opposite realms; they can peacefully coexist in the same space with best practices that serve the needs and interests of young children. Academic rigor concentrates on one dimension of education—the academic. Developmentally appropriate practice considers the whole landscape of learning—the motivational, cultural, and social and emotional as well as the cognitive. Rigor and developmentally appropriate practice can peacefully coexist in the same space with best practices that serve the needs and interests of young children. In this article, we demonstrate the rigor of developmentally appropriate practices so that early educators can share with their elementary school counterparts and administrators how their developmentally appropriate curriculum and teaching approach support children’s learning in the preschool years while also helping build the foundation to support children’s success in the primary years. As a construct, academically rigorous developmentally appropriate practice melds what is known about academic rigor with developmentally appropriate practice. An academically rigorous learning environment is one in which each child has the opportunity and support from the teacher(s) to achieve academic goals and standards (Blackburn 2012). As Wagner (2008) points out, academic rigor “is not a checklist of teacher behaviors and a model lesson that covers content standards” (25). Rather, it is the process of working with all children in a manner that addresses the whole child through hands-on learning experiences that “challenge the mind” and “connect learning to real world context” (Washor & Mojkowski 2006/2007, 87). Developmentally appropriate practice uses developmental theory to promote instruction that focuses on the growth and learning of individual children across all developmental domains in a manner that addresses “the social and cultural contexts” in which they live (Copple & Bredekamp 2009, 10). Academically rigorous, developmentally appropriate learning environments are those in which teachers provide children with multiple learning opportunities to gain the knowledge and skills needed for success in elementary school. These learning experiences take into account children’s developmental, individual, and sociocultural needs. As the school year progresses, teachers build on content of instruction and increase their performance expectations for children. At the same time, teachers ensure they provide appropriate levels of support to children through regular and consistent monitoring of children’s achievement across developmental domains. The goal is that by the end of the school year, every child has—or is on a developmental trajectory to soon attain and demonstrate on a regular basis—the knowledge and skills needed for kindergarten success. 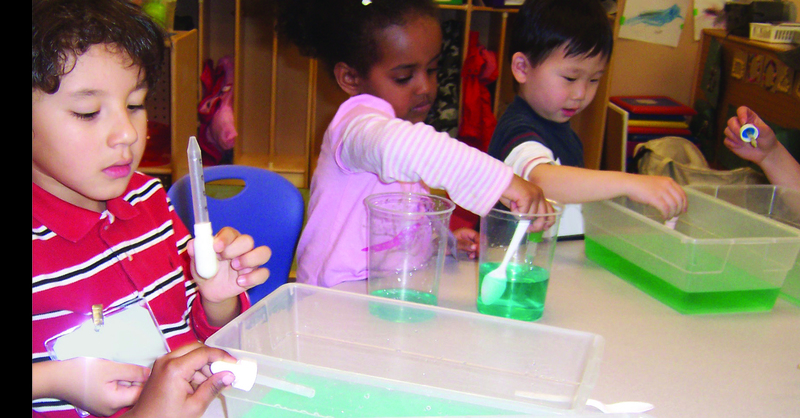 The learning activity “Prekindergartners Explore Water” exemplifies the ways in which early educators link their understanding of children’s developmental needs with the knowledge and skills children require to be ready for kindergarten and beyond. The sections that follow explain how Ms. Bauer’s presentation of this science exploration incorporates the key components of academically rigorous developmentally appropriate practice that early childhood teachers engage in on a daily basis. A class of pre-K children, along with their teacher, Ms. Bauer, is investigating the properties of water. Over the past six weeks, the children have had numerous opportunities to examine the properties of water through a range of learning experiences that offer them the chance to take the lead in their own scientific inquiry. They have compared the taste of water as a solid and as a liquid. They have compared the sounds water drops make on different types of surfaces (paper, tin, plastic). They have shared stories both orally and through written products about their experiences with water (playing in the bathtub, going to the beach, visiting a water park). They have made predictions about whether a ball of ice melts faster in a picnic cooler or on a tray in the classroom. They have spent time each day manipulating water with a range of tools (measuring cups, pipettes, turkey basters) in both indoor and outdoor workstations. Today, during morning center time, the children gather at three different workstations. Two are water tables set up for children’s exploration and discovery, and at the third, paper and colored pencils are set out for children to draw pictures about what they have been doing with water during the past week. Ms. Bauer is at one of the water tables and is about to guide four preschoolers, Esther, Alejandro, Alicia, and Raul, through an exploration of the properties of water—specifically, the concept of cohesion and the effects of force and motion on water. They will do this by moving water drops around on plastic trays. Ms. Bauer continues, “I have a question: What’s another way to force the water to move around?” Alejandro replies, “With your hand.” Ms. Bauer says, “With your hand is one way. Is there another?” She gives the children time to think. No one answers, so she blows on a water drop on her tray. Alicia responds, “Oooh,” and Raul says, “Cool, I’m going to try that.” The children begin to copy and extend Ms. Bauer’s actions by moving around their trays and trying to blow down as well as across the drops on their own trays. The conversation continues, and Ms. Bauer records the children’s observations on a small whiteboard. Ms. Bauer supported the children’s academic learning by engaging them in the scientific method of experimentation with water, reminding them that they would make predictions, engage in a particular action, and evaluate their work. This learning activity also introduced the children to the scientific principles of cohesion, force, and motion. Ms. Bauer used such scientific terms as experimenting to explain the work they were doing and droplets to describe what occurred to the water as they forced it into smaller drops. Doing so provided the children with a hands-on, meaningful, and developmentally appropriate learning experience that motivated them to intentionally reflect on their informal knowledge about how force, motion, and the property of cohesion work together to change the appearance and shape of water. This activity also reinforced the scientific process and introduced them to several scientific principles they will revisit and expand upon in the later grades. By making a connection between the children’s water experiences at home and this learning experience, Ms. Bauer built on their background knowledge to construct new understandings—in this case, seeing how the physical world can be altered through force and motion. As the National Research Council (2000) noted in its framework for teaching and learning, connecting new knowledge with past experiences is essential for learning. Furthermore, when children fail to grasp a particular lesson or topic of study, it is more likely due to the flaws in the task or the children’s lack of background knowledge than to the complexity of the concept itself. The water experience reflects an understanding that while child development is varied and uneven, it follows a typical pattern in which advancement in one developmental domain is dependent on and influential in development in others (Bowman, Donovan, & Burns 2000). Such knowledge allowed Ms. Bauer to concentrate her efforts on designing age-appropriate learning experiences that led children to engage with the academic content in multiple ways. As she did this, Ms. Bauer scaffolded the children’s learning by providing them with the content to understand and the vocabulary to describe what happened to the water drops. For example, she helped the children see the connection between rain and water drops. Then, when the children experimented with the water drops on their trays, she extended their manipulation of the drops by showing them how the force of her breath could disperse the water into droplets. She also provided them with new vocabulary when reiterating their discoveries. The built-in variability of this activity and Ms. Bauer’s use of small instructional groups created the opportunity to closely monitor the children’s scientific thinking. Based on their discussion and questions, Ms. Bauer easily adjusted her interactions with the children to their individual learning (level of experience with moving water) and cultural needs (allowing children like Alejandro, from cultures in which children are taught not to look adults in the eye, to speak to her without asking them to look directly at her). This exploration also offered her the chance to differentiate the level of support she provided each child (helping Alejandro with the word cohesion), the difficulty and breadth of the content she discussed with the children (revisiting the scientific principles and terminology with Esther at the end of the lesson), the level of participation she expected from each child (having students mimic Esther moving her tray), and the terminology she expected each child to learn and use (connecting the children’s terminology, e.g., shake and pop, to the scientific terms force and droplets) (Smutny & von Fremd 2010). By having the children work together, Ms. Bauer enabled each child to contribute to the group’s generation of knowledge. Developing a shared understanding of what happens when water is manipulated by forces such as motion compensates for the tendency of 4- and 5-year-olds to go off on different tangents in open-ended learning activities (Rogoff 2003). Alerting the children to how Esther moved the water on her tray by lifting it, which refocused them on the task at hand, exemplifies this point. Ms. Bauer created a social dynamic in which the children’s group participation as a team that worked together to experiment with water not only kept each child focused on this learning situation but also offered the children the chance to question, respond to, and build on each other’s ideas and suggestions. This lesson is one of many in which the children engaged with each other and Ms. Bauer during their study of water. Whereas some lessons emerged from and built on children’s open-ended explorations (e.g., water play at the water station during choice time), others followed the lead of Ms. Bauer’s guidance. She understood that such instruction is necessary but should be limited (Bonawitz et al. 2011). Ms. Bauer will revisit these concepts later, spiraling the curriculum to allow the children to review aspects of a concept that they may have known well in one context but nonetheless failed to demonstrate mastery of when it is was applied in novel situations (National Research Council 2000). Understanding this allowed Ms. Bauer to go forward with her teaching because she knew the children would review and practice their new skills and knowledge again and again through multiple learning opportunities. In this one lesson, the children used their physical (manipulating an eye-dropper), conceptual (describing and evaluating their movement of water droplets), emotional (regulating their responses to Ms. Bauer’s challenges), and social (working in a small group) skills to complete an activity. Incorporating such an activity into the curriculum reflects Ms. Bauer’s understanding that growth in one development domain influences growth in the other domains (Bowman, Donovan, & Burns 2000). This activity required the children to apply not only their scientific knowledge but also their literacy skills (using language to explain the phenomenon) and spatial–mathematical knowledge (describing the directional movement of drops: front, back, different side). Fostering a learning environment that offers children a range of activities to develop their academic skills not only allowed Ms. Bauer to reinforce what she taught the children throughout the day but also gave the children the chance to develop the skills they would need for success in the later grades. For instance, developing a scientific vocabulary would positively affect their reading comprehension (Moats 2009). Finally, during this lesson and across the day, Ms. Bauer documented children’s learning by recording and dictating their statements about the water-moving experiment. It is common practice for Ms. Bauer to transfer those notes to children’s individual learning portfolios containing photographs and child-generated artifacts that document their learning. Ms. Bauer used the documentations in this case to help her understand what the children did and did not know about force, motion, and cohesion to adjust her instruction accordingly (Blackburn 2012). Early childhood teachers should be advocates for what they do, informing others about their classroom teaching practices. The intensity of political discussions about preparing children to perform on a series of academic achievement exams that await them in elementary school has led many teachers across the various fields of public education to consider simply retreating to their classrooms and shutting their doors (Madaus, Russell, & Higgins 2009). Refusing to acknowledge this problem, however, will not make it disappear. We believe early childhood teachers should confront this issue by being advocates for what they do and informing others about how their classroom teaching practices build on children’s developmental, individual, and sociocultural strengths and prepare the children for the rigor of elementary school learning. Some suggestions for communicating with others follow. When talking with elementary school colleagues and administrators, remind them that young children learn and develop differently than older students. Young children have limited attention spans and are just beginning to develop a level of intentionality in their learning (Stipek 2011). Additionally, learning new content is not a seamless process (even for adults). Help colleagues and administrators understand that children are inconsistent in demonstrating their newfound skills and need multiple opportunities to internalize new information. Because of this, consider letting people unfamiliar with developmentally appropriate practice know that creating an academically rigorous, developmentally appropriate early learning environment requires enabling children to experience a complex set of multimodal learning activities based on their developmental, individual, and sociocultural knowledge. Some of the teaching strategies they might see in such classrooms include whole group, small group, and center-based instruction; child-initiated activities; indoor and outdoor play-based learning activities; and loud and quiet learning activities. Depending on the length of the school day, visitors to the classroom may see children eating snacks or taking naps. Discuss with colleagues and administrators how the various activities are developmentally appropriate and tie in with the learning goals set for children across each day, week, and month, and across the school year. Some additional topics of conversation include the skills and knowledge preschoolers bring with them to kindergarten and how such learning is monitored. Almost every state has a set of early learning standards. Being familiar with these standards and being able to show how the related content is touched on throughout the day helps elementary school counterparts understand the learning that takes place daily. Last, consider talking with elementary school colleagues about how to work together to help children and their families succeed in school. Many of the topics suggested for conversations with colleagues and administrators are also appropriate when talking with families. However, when talking about rigorous developmentally appropriate practice, there is sometimes a tendency to overemphasize children’s cognitive and academic development. Consequently, it is easy to forget to include all the important things you do to foster children’s passion for learning and to help them grow in all developmental domains. We think that in conversations with families, touching on how your instruction supports not only children’s cognitive development but also their social, emotional, and physical development helps families understand how much their children are cared for in the early childhood classroom. Because many families lead very busy lives, connecting in a meaningful way can be difficult. It is therefore essential to reach out to families in as many ways as possible. Ms. Bauer sends home weekly newsletters and maintains a password-protected blog, providing families with easy access to information about what their children are doing in class. She commented to us that one reason she feels she is an effective early educator is the connections she has made with the families. She sees sharing the children’s learning with families through multiple forms of communication as part of her role as a teacher. By providing academically rigorous, developmentally appropriate instruction, early childhood teachers engage in learning experiences that help children learn the foundational knowledge and skills they need to succeed in elementary school. The components of academically rigorous developmentally appropriate practice outlined in the article reflect a process in which early educators expect children to learn and demonstrate the knowledge and skills needed for school success. They do this through engaging in practices that take into account what is known about how children develop across the cognitive, social, emotional, and physical domains, what they know about children’s individual needs, and the sociocultural needs of their learning community (Copple & Bredekamp 2009). We believe it is vital that early educators inform elementary school colleagues, administrators, and families about the strengths each child possesses as well as the importance of how teachers facilitate children’s learning and development. When teachers explain how the intentionality of their instruction offers children meaningful choices, opportunities to experiment with new ideas in a safe and comfortable setting, and time to revisit new knowledge and skills, colleagues, administrators, and families better understand how the academic rigor embedded in developmentally appropriate practice builds on what children know and can do so that they can develop the skills and knowledge needed to be successful in kindergarten and beyond. Authors’ Note: We thank the Spencer Foundation and its Small Research Grants program for their support of this study. Blackburn, B.R. 2012. Rigor Is NOT a Four-Letter Word. 2nd ed. New York: Routledge. Bonawitz, E., P. Shafto, H. Gweon, N.D. Goodman, E. Spelke, & L. Schulz. 2011. “The Double-Edged Sword of Pedagogy: Instruction Limits Spontaneous Exploration and Discovery.” Cognition 120 (3): 322–30. Bowman, B.T., M.S. Donovan, & M.S. Burns, eds. 2000. Eager to Learn: Educating Our Preschoolers. Washington, DC: National Academies Press. Brown, C.P. 2013. “Reforming Preschool to Ready Children for Academic Achievement: A Case Study of the Impact of Pre-K Reform on the Issue of School Readiness.” Early Education and Development 24 (4): 554–73. Copple, C., & S. Bredekamp. 2008. “Getting Clear About Developmentally Appropriate Practice.” Professional Development. Young Children 63 (1): 54–55. Copple, C., & S. Bredekamp, eds.. 2009. Developmentally Appropriate Practice in Early Childhood Programs Serving Children From Birth Through Age 8. 3rd ed. Washington, DC: National Association for the Education of Young Children. Madaus, G.F., M. Russell, & J. Higgins. 2009. The Paradoxes of High Stakes Testing: How They Affect Students, Their Parents, Teachers, Principals, Schools, and Society. Charlotte, NC: Information Age. Moats, L.C. 2009. “Knowledge Foundations for Teaching Reading and Spelling.” Reading and Writing: An Interdisciplinary Journal 22: 379–99. Rogoff, B. 2003. The Cultural Nature of Human Development. Reprint ed. New York: Oxford University Press. Shonkoff, J.P., & D.A. Phillips. 2000. From Neurons to Neighborhoods: The Science of Early Childhood Development. Washington, DC: National Academies Press. Smutny, J.F., & S.E. von Fremd, eds. 2010. Differentiating for the Young Child: Teaching Strategies Across the Content Areas (K–3). 2nd ed. Thousand Oaks, CA: Corwin Press. Stipek, D. 2011. “Classroom Practices and Children’s Motivation to Learn.” In The Pre-K Debates: Current Controversies and Issues, eds. E. Zigler, W.S. Gillam, & W.S. Barnett, 98–103. Baltimore: Brookes. Wagner, T. 2008. “Rigor Redefined”. Educational Leadership 66 (2): 20–25. Washor, E., & C. Mojkowski. 2006/2007. “What Do You Mean by Rigor?” Educational Leadership 64 (4): 84–87.